(PhysOrg.com) -- A team of researchers from the NIST Center for Nanoscale Science and Technology, the University of Muenster, and West Virginia University have demonstrated control of magnetic thermal fluctuations using current. The work, reported in the September 2 issue of Physical Review Letters, represents an important step towards manipulating the noise properties of magnetic nanosensors and memory devices. The magnetic fluctuations of a 2 µm-diameter disk of a Ni-Fe alloy (permalloy) were measured using microfocus Brillouin light scattering while a current passed through a supporting Pt strip. The current generated a spin current, which was injected into the permalloy disk through its back surface. As electrons flow along the Pt strip, they scatter differently, depending on each electrons spin: those with up spin scatter slightly toward the top surface, while those with down spin scatter slightly toward the bottom surface. 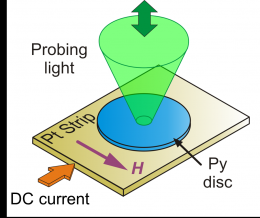 This spin Hall effect drives a spin current, but not a charge current, into the bottom of the magnetic disk. The measurements show that the thermal fluctuations of the disks magnetization are suppressed if the injected spins are parallel to the magnets spins, and that the fluctuations are strongly amplified if the injected spins and the magnets spins are antiparallel. By changing the current down the Pt strip, the fluctuations were controllably reduced to 0.5 times or amplified to 25 times their thermal level. The measured population of the disks magnetic excitations differs from a thermal distribution, showing that the effect is not simply cooling or heating. These intriguing results provide insight into the complexity of spin current phenomena and suggest a route for controllably manipulating fluctuations in future magnetic nanodevices. More information: Control of magnetic fluctuations by spin current, V. E. Demidov, S. Urazhdin, E. R. J. Edwards, M. D. Stiles, R. D. McMichael, and S. O. Demokritov, Physical Review Letters 107, 107204 (2011).